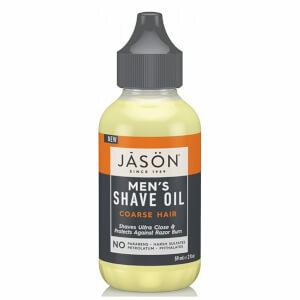 Achieve a close and comfortable shave with JASON Mens Shave Oil for Coarse Hair. Enriched with Grapeseed, Argan and Castor Oils, the gentle formula softens each beard hair and conditions the skin to improve razor glide and create an extra-smooth shave. Helianthus Annuus (Sunflower) Seed Oil (1) , Simmondsia Chinensis (Jojoba) Seed Oil (1) , Octyldodecanol, Argania Spinosa Kernel Oil (1), Coco-Caprylate/Caprate. , Sorbitan Oleate, Abies Sibirica Oil, Citrus Aurantium Bergamia (Bergamot) Fruit Oil, Citrus Aurantium Dulcis (Orange) Peel Oil, Citrus Limon (Lemon) Peel Oil, Eucalyptus Globulus Leaf Oil , Eugenia Caryophyllus (Clove) Leaf Oil , Helianthus Annuus (Sunflower) Seed Oil Unsaponifiables, Juniperus Virginiana Oil , Lavandula Hybrida Oil, Melaleuca Alternifolia (Tea Tree) Leaf Oil (1), Pogostemon Cablin Oil , Ribes Nigrum (Black Currant) Seed Oil , Ricinus Communis (Castor) Seed Oil, Vitis Vinifera (Grape) Seed Oil (1), Aloe Barbadensis Leaf Juice (1), Cardiospermum Halicacabum Flower/Leaf/Vine Extract , Rosmarinus Officinalis (Rosemary) Leaf Extract , Tocopherol , Tocopheryl Acetate, Bisabolol , Caprylic/Capric Triglyceride , Heptyl Glucoside, Polysorbate 20, Triethyl Citrate , Citronellol, Eugenol, Geraniol, Limonene , Linalool.